Book is Bargain Priced starting 05/20/2018 and ending 05/31/2018. How do they always live life to the fullest, despite numerous obstacles? What do they have that people who fail don’t? Are there secrets to their success? Methods that work? You strive for a better, easier, and happier life. You are fed up with living in gloom, frustration, stress, or discouragement. You want to rediscover motivation, joy, and inner peace. You think that you have tried everything and you have already read dozens of books in your quest to find answers. The author has read over a thousand of them. During 40 years he has read, tested, observed and experimented with them all. 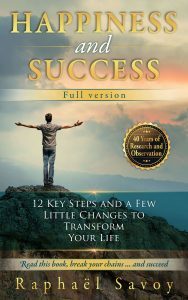 “Happiness and Success – Full version” is not a mere compilation of the best existing techniques, but the result of 40 years of work and experience that has taken the form of a comprehensive method. You will find inside only formulas that work, and it’s the subtle alchemy between all the elements that makes the method a good one. You will learn how to use the incredible power of your brain to overcome your worst enemy, the one that lurks within you. You will understand how to make a few tiny adjustments to the way you see things so that everything can start falling into place. You will see how to free yourself from fear, which Napoleon Hill described more than 50 years ago as the main reason for failure. Decide at last to turn your life into a masterpiece. Read, break your chains, come out from Plato’s cave … and succeed.